Prior to my trip to Colombia, I checked McDonald's Colombia homepage in order to see if they had any special items, but nothing looked all that interesting. My original 6 day trip to Bogota was cut down only to 2 days, so I had to make sure I stopped in shortly after my arrival. I asked my friend to drive me to the nearest McDonald's after a nice home cooked meal, and apparently the nearest one from his flat was about a 20 minute drive. He told me McDonald's has really struggled in Colombia, and they have been closing rapidly. I looked over their menu, and sadly there weren't any limited time promotional items, and my Colombian friend asked the employees directly if there was anything special. 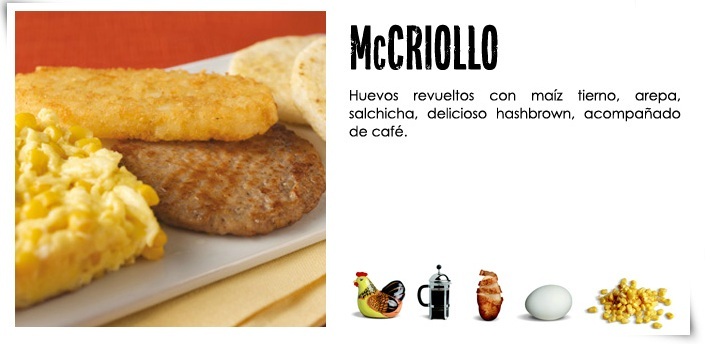 They said I would have to come back for breakfast, as their only 'Colombian' item was the McCriollo breakfast set. The following morning I was dropped off downtown by my friends mother on her way to work. I wasn't hungry right away, so I wandered around in order to build up my appetite. When I did become hungry, it was rather difficult to find a McDonald's. I found some free WiFi, so I used Google Maps to find the only branch in the city centre. When I found it, I found a branch similar to some Japanese outlets, with the ordering done from the store front that was nearly on the pavement, and you took your order upstairs to the dining room. At the time I was the only person ordering, and it took still a few minutes to receive my order. I walked upstairs to the dining room, and it was large, stylish and clean, but there was only 2-3 other diners, in a dining room that could have fit maybe 75 people. Even during these early hours, there was someone constantly cleaning the floor and the tables as people came and left. I sat in a booth next to the window which had a nice view of the square, and the museum across the street. The coffee, was hands down, the best McDonald's coffee I have ever had. I guess being Colombia...it better be. I guess it was worth waiting the extra few minutes for my order, as it seemed everything had just been made to order. The scrambled eggs were surprising as they had sweetcorn mixed into it, and were slightly runnier than scrambled eggs you would get in Canada but still very good. The arepa's (corn flat bread), were slightly harder and chewier than I have had before. Not sure if this was because it was to Colombian tastes, or if a just poor McDonald's attempt. The sausage, was meatier than the sausage you get in Canada and the U.S. but it wasn't anything special, though, even though it was piping hot, it wasn't dripping in grease, which is a nice change.